Ken Shaw is a master at gaslighting - however the only people who believed him were those who were less intelligent than him, the DSS attorney and the AFCs. Let's start with the obvious - Jon Massey was not at the house and had not been at the house since the onset of this matter when he was served with the orders of protection. Not only was he NOT at the house, at the time in question he was at an appointment with his therapist, and then making the follow-up appointment with the receptionists (yes, plural). 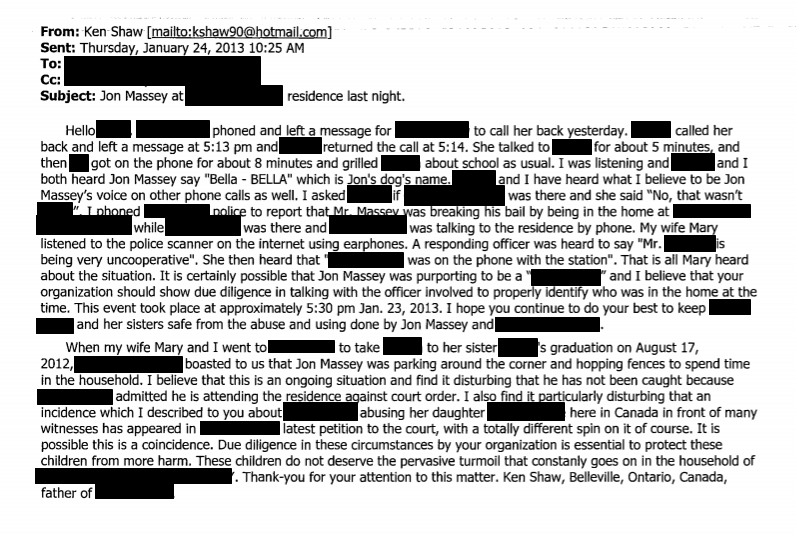 In fact, what should stand out is that while Ken Shaw was calling the police, his wife Mary had already gotten on the computer, logged on to the website for the local police scanner, and had put on headphones to make sure she heard what happened. I'll add another layer of context for you - Ken and Mary live in another country, approximately three hours away. In order for Mary to even know that there was a police scanner website for our locality, the two of them would have had to research it IN ADVANCE. Just as she was ready IN ADVANCE to listen to what happened as a result of the false police report. That sounds like pure premeditation. It is odd that when the police actually showed up at the house, neither my daughter nor I were here - I had left to deal with some insurance issues with my son, and my daughter had left to pick up a friend from work. More to the point, neither of us had EVER told Ken Shaw that Jon was sneaking into the house - what he had been told in August was that Jon was living with his mother over 20 miles away. As to "Jon's car"? It was actually registered to his mother, and while living with her, then his sister, and finally a friend of ours, he had no need of the car as others were available to him. So his mother had allowed my daughter to use the car to transport herself to the local college and her job, as Jon was no longer available to do so. In fact, at visitations on at least three occasions prior to the false report, IN FRONT OF Ken and Mary Shaw, my daughter had told her youngest sister about driving the car to and from school and work. Additionally, the caseworkers had seen the car parked IN THE DRIVEWAY OF OUR HOUSE on two home visits they conducted. 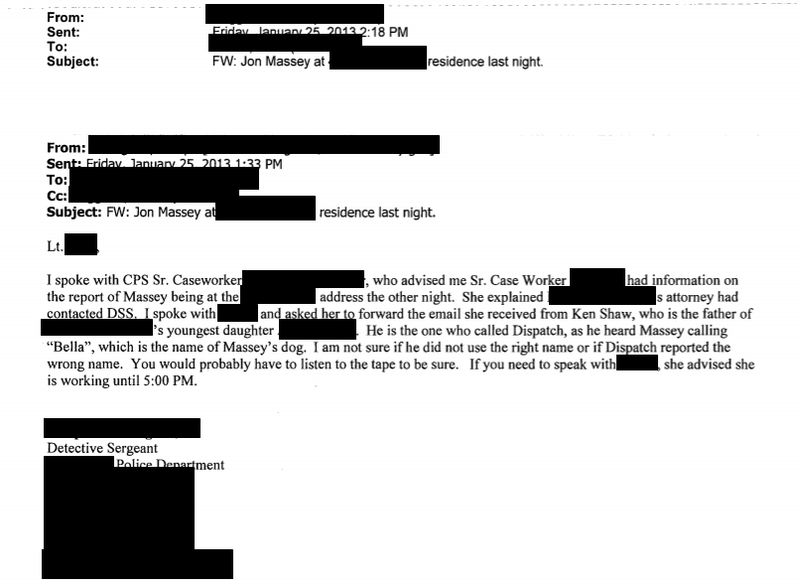 The person who approached the DSS Attorney was Ken Shaw's attorney, obviously setting the stage for the false reports. The result was that our house was raided at about 3 am Sunday morning - searched top to bottom by police officers who tracked mud all through the house. And once again, Jon Massey was not there. Why? Because unlike Ken Shaw (who has lied to police by his own admission under oath and by his actions above, has lied to a judge under oath, and who has a long history of being a scofflaw) Jon Massey believed in playing by the rules. Rules which were violated not only by the DSS Attorney, but also by the ADAs and the judges involved in the Jon Massey case.